For over thirty years I have been admiring the great columnar cactus, Saguaro (Carnegiea gigantea). When they are about 60 years old some, but not all, of them start growing arms. 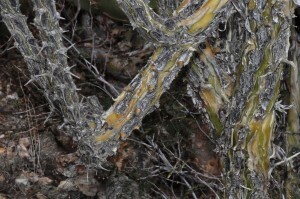 Much later, some of the arms might begin to grow arms. What if those arms grew arms? 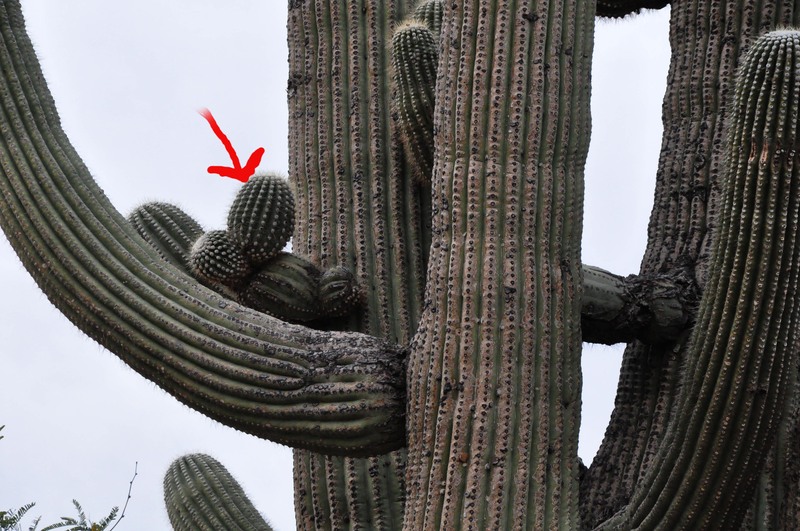 About ten years ago I became obsessed with the task of finding one with an arm on an arm on an arm, what you might call a third-generation outgrowth. On one of our hikes in Catalina State Park years ago we saw one but I did not get a photograph. Since then every time I go to that park I look for it. So far no luck. 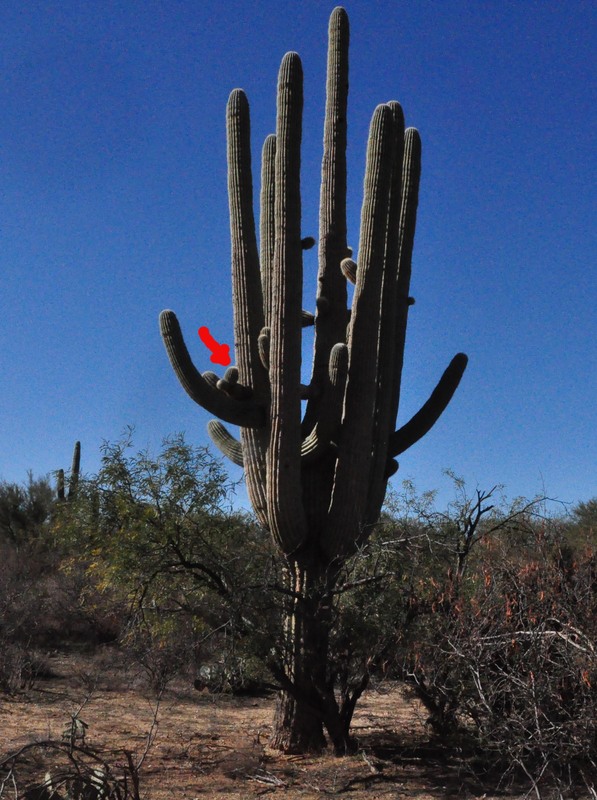 But last week Ed and I were walking on the Pink Hill Trail in Saguaro National Park East, and there was a giant Saguaro. Ed pointed out that it did indeed have an arm on an arm on an arm. 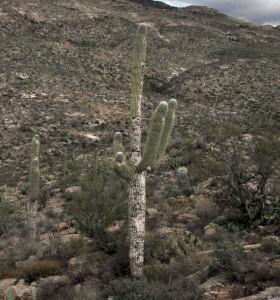 We hiked again yesterday, this time on the Ridge Trail on the south side of the Rincon mountains. 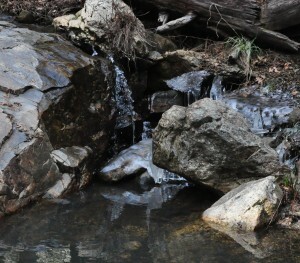 The trail ends at a beautiful outcropping of rock with a panoramic view of the area. 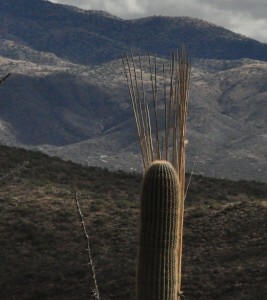 We noticed a Saguaro whose south side was almost pure white. We studied it a little and came to the conclusion that it had been pelted with stones over the years and, for some reason the whole south flank turned white. 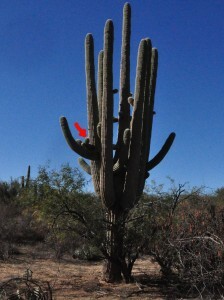 Then, as we retraced our steps, we looked in the distance at a Saguaro that looked like it had just had a terrible shock, with hair standing on end. Of course we were seeing two saguaros. The one behind was now a skeleton with its ribs pointing skyward. 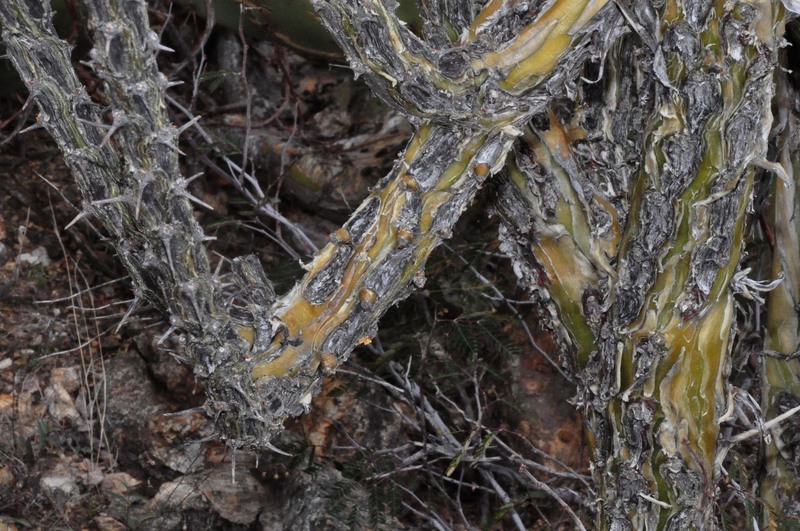 Then we saw an Ocotillo (Fouquieria splendens) with several of its branches turning downwards and then turning back skyward. It must have been injured in some way. 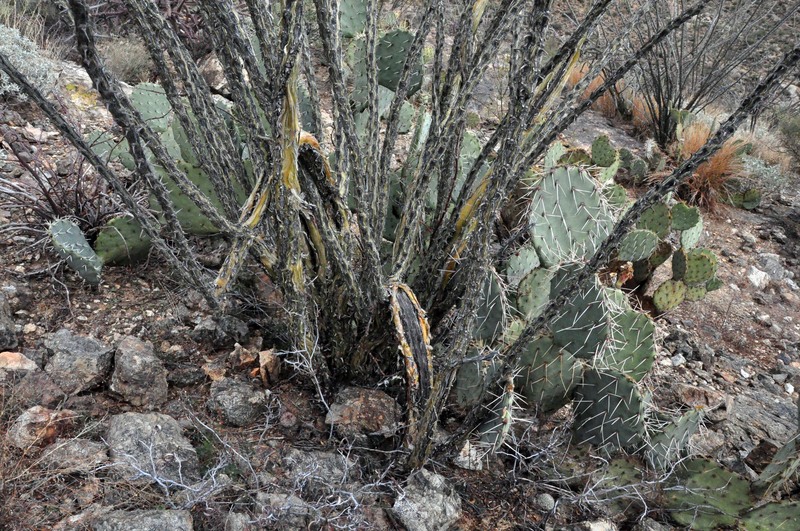 It is the day before Christmas, and we are still seeing plants in bloom. Yesterday it was Pringle’s Prairie Clover (Dalea pringlei), and Creosote Bush (Larrea tridentata) plus lots of dogweed (Thymophylla pentachaeta) and others. Every month of the year we find plants in bloom. Soon the early spring flowers will brighten our walks. 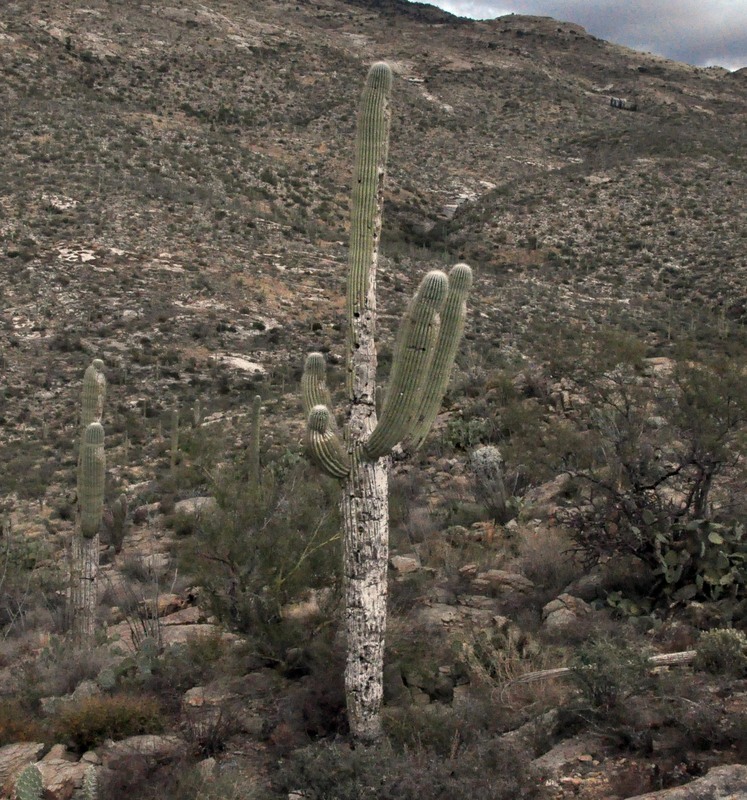 Lately Ed and I have been confining our weekly hikes to the desert around Tucson but last Wednesday both of us felt a desire to drive up into the Catalina Mountains. Since it was 40 degrees in the valley when I woke up, and the mountain temperatures are usually 20 or 30 degrees cooler than the valley, I worried a little about being too cold. My worries were unfounded. We drove up the mountain, stopping first at Molino Canyon Vista, where we saw fleabane, trixis, tufted evening primrose and a few other species in bloom. We continued up the mountain to Marshall Gulch at about 8000 feet. It was a sunny day with a light cloud cover. We hiked along the stream (Sabino Creek), and were sure we would not see any flowers in bloom this time of the year. The air was clear and the woods beautiful in the winter sunlight and we were in bliss. 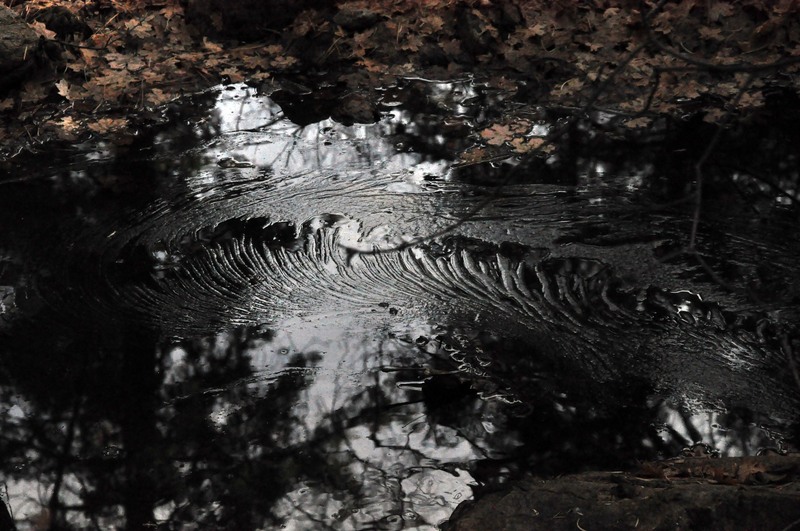 We noticed the beautiful ripple patterns of foam on the stream in certain spots (see the pictures). 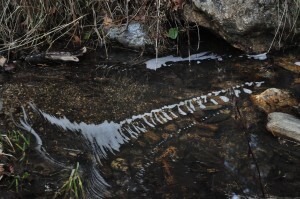 The first picture looks like a skeleton but it is a row of foam spreading out from a tiny waterfall. The last two pictures show ice along the stream. There were small patches of snow were here and there in the woods, and many of the rocks along the stream were covered in ice. We joked about getting a special prize if we saw any flowers in bloom. Then, on the way back, we almost stepped on a flower in the middle of the trail. 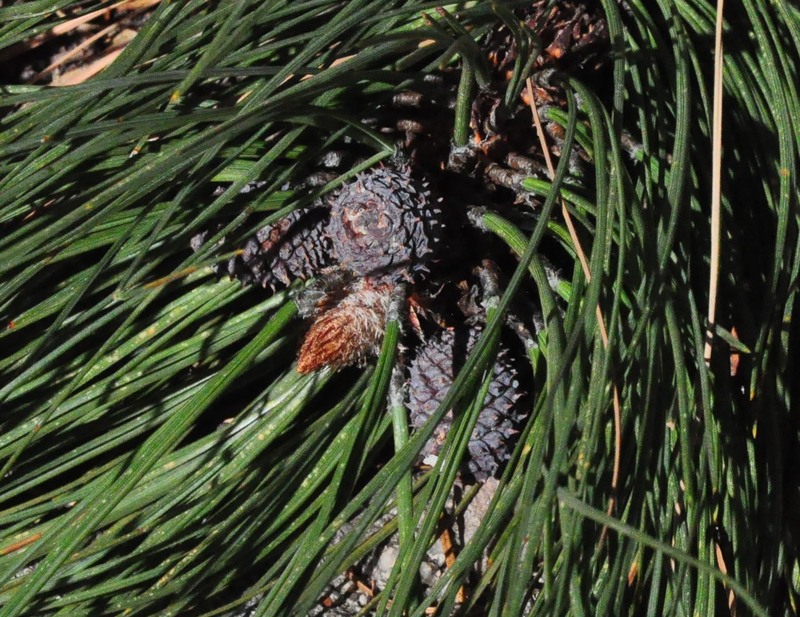 Well, it wasn’t exactly a flower, but the the tip of a Ponderosa Pine Branch, evidently broken off by a squirrel, with a cluster of female flower cones on it. This tree was blooming way out of season. 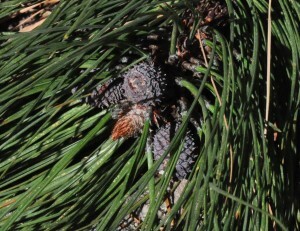 We enjoyed the soft blue color of these Ponderosa female flower cones. 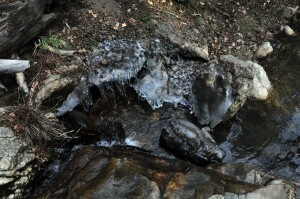 The parts of the trail nearest the creek were chilly, since cold air tends to gather in low places, but not drastically cold. By the time we got near the car park we were ready to take off our jackets. In less than a week Marshall Gulch will be closed for the winter, so we were especially pleased to have such a pleasant walk this deep into December.